Did you know 48 Million people have engaged in listening to podcasts? Forty-eight million. That’s more than double the highest-rated television program, which is NFL Sunday Night Football. That’s a crazy massive amount of listeners. Podcasts can be unbelievably helpful, fun, and thought-provoking. Business and marketing podcasts have really taken off and entrepreneurs are clamoring for them. However, how can you go through hundreds of podcasts for business? 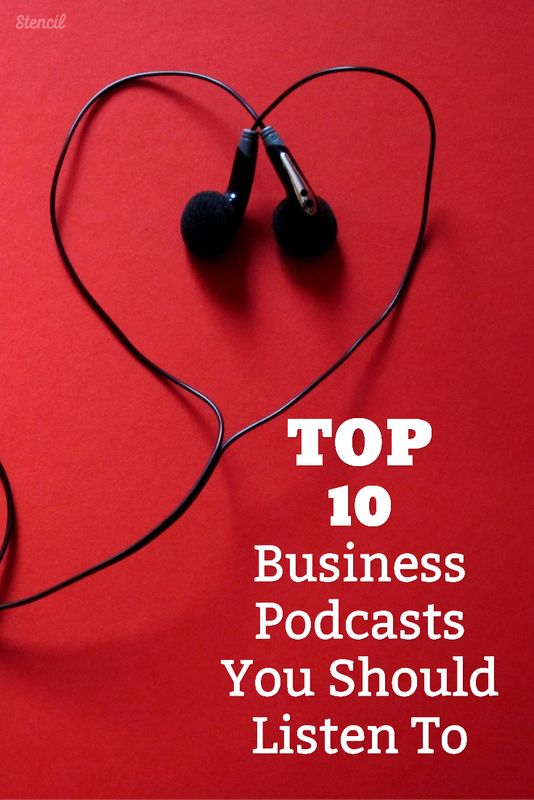 We’ve gone through several business podcasts and narrowed the list down to ten. It was not easy. We’re happy to bring you the top ten you should listen to. The whole point of listening to podcasts is to get the best content in the most convenient way. As a business owner, you’re busy and you’re on the move doing stuff for your biz. So we’re looking at podcasts that offer the best business content, encourage new perspectives on marketing, entertaining and convenient. Convenience meaning they’re not just listed on iTunes or Stitcher. You have to have options for your listening pleasure. If you’re on a Mac, then iTunes it is. If you’re not on a Mac, then the podcaster should have options on their website people can listen to directly on their site, Stitcher, PlayerFM, Spotify, etc. We’ll start off with the most unconventional and fun podcast you’ll probably ever hear! Andrew and Pete are the hosts and they interview entrepreneurs, influencers, and marketers in a game show-type way. They are pretty hilarious and make guests play games while answering business/marketing questions. You’ll get a kick out of episode 10 – OMG We Killed Kim Garst, they didn’t really but almost. She’s such a good sport! 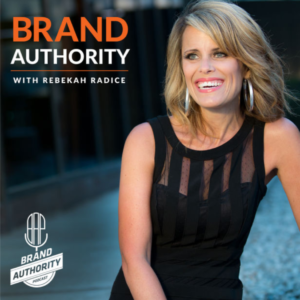 Rebekah Radice is the Brand Authority host and she brings actionable tips for entrepreneurs, small business owners, and marketers. 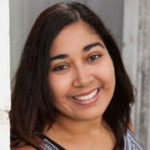 She’s to the point and sincerely wants to help business owners with typical social media and branding questions. Each episode will give you a sneak peek into the systems, processes, and skills necessary to design a scientific and strategic marketing approach. She’s amazing! Check it out. Episode 23 – How to Build a Social Media Calendar is a favorite. So many great tips! 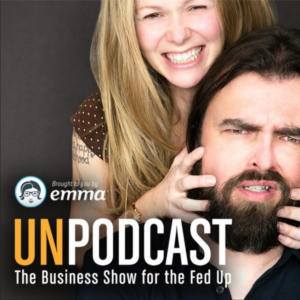 Scott Stratten & Alison Kramer host the Unpodcast. It’s a different podcast approach, where they talk about real life trending events and stories about excellent or horrible marketing. It’s interesting and you may find some marketing nuggets that you can use in your business. A favorite episode is 208 – It’s All Downhill From Here, where they talk about amazing customer service and ridiculously bad customer service. Social Pros is hosted by Jay Baer from Convince and Convert and Adam Brown from Salesforce. 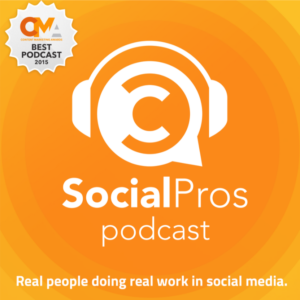 Social Pros has incredible stories and behind-the-scenes secrets from mid-large corporations and how they operate their social media. So many business and marketing tips to learn. Love the interviews, especially episode 291 –Why Stories Is the Key to Company Instagram Success Today with Sue B. Zimmerman. 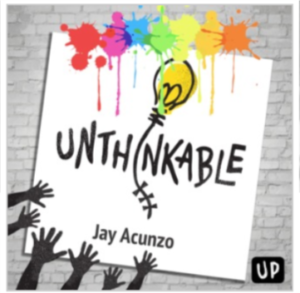 Jay Acunzo is the host of Unthinkable podcast, which is a refreshing and an inspiring look at marketing and business. Stories captured in an entertaining manner and refreshes a marketer’s perspective. Jay shares stories of people who do work that seems crazy, until you hear their side of the story. Jay’s driving belief is that exceptional work happens when you find and follow what makes you an exception. You’ve got to listen! You’ve got listen to “The Man Bun” episode. Jay is the master of storytelling. 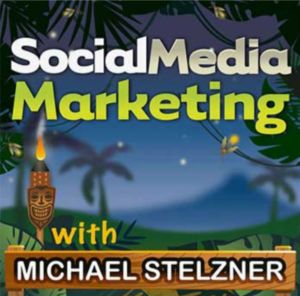 Michael Stelzner is the host on Social Media Marketing, who is the top-rated social media marketing resource. Just as informative as their blog, they interview social media influencers to get the latest trends and newest strategies on all social media platforms. 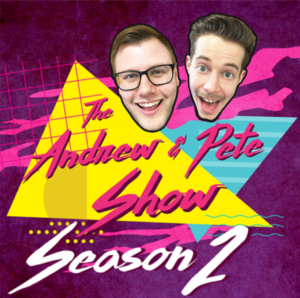 Love this episode with Andrew and Pete and Michael Stelzner! It’s all about how to connect with people on Twitter. Noah Kagan is the host of Noah Kagan Presents and you probably know him from okdork.com, sumo.com, and appsumo.com. He’s a pretty funny taco-loving guy and knows a thing or two about online business. 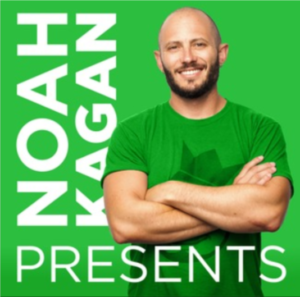 His podcast has impressive interviews from influencers, celebrities, and CEOs. Lots of great business advice here! Listen to this episode right here. It has real hard-hitting truth on not letting money change you and how to live your life. 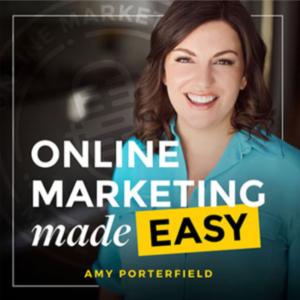 Amy Porterfield is the host of Online Marketing Made Easy where she provides actionable tips, expert interviews, and intimate behind-the-scenes secrets from her biggest launches. Amy goes through the typical questions online entrepreneurs ask about their business. Episode 201 – Five Ways to Make Money (Without Using Webinars) is full of awesome tips! 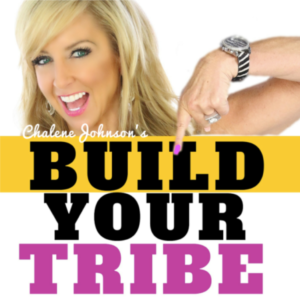 Chalene Johnson is the Build Your Tribe host. She brings a wealth of knowledge with interviews and practical strategies from top internet influencers. They discuss how to build an email list, create a virtual community, strengthen a tribe and bring a powerful group of like minded people together to make a difference in the world. Love her confidence! Have a listen. Chalene has some truth bombs in this Episode 220 – How Much Should You Share on Social Media. This brings me to the final and #1 podcast on our list. Where he brings authentic perspectives on making money using social media, blogging, and online businesses. 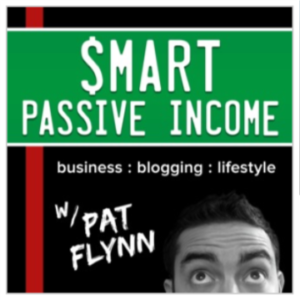 Pat Flynn is the host of Smart Passive Income and he has been helping people create multiple passive streams of income from online businesses or blogs. He has so many tricks and tips plus interviews to learn from. In this episode 310 – The Secret to Super Fans in Two Words, leaves some incredible advice and challenges you to do more for your followers. Are you ready to listen to a business podcast? 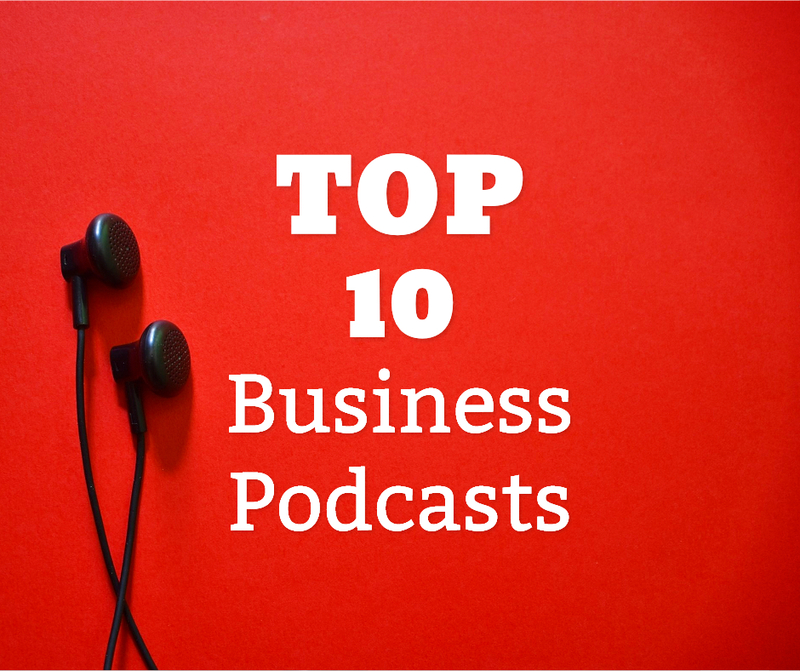 This top ten podcast list gives a variety of in-your-face business tips, funny marketing, refreshing business strategies, and entertaining business approaches. You can’t go wrong with these podcasts! There’s something for every type of business. What business podcast do you listen to and learn from the most? Have you listened to any of these? Let us know in the comments.